David Nicholls trained as an actor before making the switch to writing. He is the author of two previous novels—Starter For Ten and The Understudy. He has also written many screenplays for film and television, including the feature film adaptation of Starter For Ten. He lives in London. To what extent do Emma’s thoughts and assumptions about Dexter [pp. 5-6] and Dexter’s sketch of Emma [pp. 8-9] rely on facile stereotypes they each harbor? In what ways do they embody more measured reflections? How accurate are their assessments? Does their initial encounter make the reader more sympathetic to one of the characters? In what ways might the reader’s gender, experiences, and prejudices affect their feelings about Emma and Dexter? What determines the path Emma follows in her post-university years? In addition to being a wonderfully comic interlude, how does her stint with Sledgehammer Theater Cooperative enrich the portrait of the time in which the novel is set? Is Emma’s explanation of why she ended up working at the tacky Mexican restaurant—“there was a recession on and people were clinging to their jobs. . . . the government had ended student grants” [p. 56]—honest? Have circumstances and “the city defeated her” or is she responsible for her own plight? In his unsent letter Dexter writes, “I think you’re scared of being happy. . . . that you actually get a kick out of being disappointed and under-achieving, because it’s easier. . . .”[p. 42]. How do Dexter’s insights into Emma compare to her own? Is he more perceptive about her than he is about himself? Does Emma underestimate her talents and potential? Despite its carefree tone, does Dexter’s letter betray certain doubts or misgivings about himself? Does Dexter’s meteoric rise in television change the fundamental dynamics between Dexter and Emma? What aspects of their relationship remain unchanged? What influences the things they say and, perhaps more importantly, what they don’t say, during their afternoon on Primrose Hill [p. 60-72]? Were you surprised to find them vacationing together in Greece the following year? Who is more aware of—and affected by—the sexual tensions and temptations they both experience? Is Dexter’s idle vision of his future [p. 9] realized during “the late twenties” (chapters six through nine)? In what ways is the actuality of his life an ironic comment on his expectations? Does he act in ways that undermine his happiness? Discuss, for example, his visit to his parents [pp. 120-135]; his humiliating debut on Late-Night Lock-In [pp. 176-7]; his hostile, crude manner at dinner with Emma [pp. 205-210]; and his glib excuses and rationalizations for his actions [p.190]. What glimpses are there of his more vulnerable side? Do they make him a more appealing character? “At twenty-seven, Emma wonders if she is getting old” [p. 115]. Do Emma’s feelings about both the satisfactions and regrets that come with being “grown-up” ring true? What explains Emma’s relationship with Ian? Is she willingly deceiving herself (and Ian)? Despite her impatience with him and his desperately unfunny comedy routines, does she have genuine feelings for Ian? At the disastrous dinner on July 15, 1995, Emma declares, “Dexter, I love you so much. . . . and I probably always will. I just don’t like you any more. I’m sorry” [p. 210]. Does Dexter recognize why his behavior leads to this break? Does he care? Could the dinner have ended differently? Compare Dexter’s reaction to his agent’s report on how he is perceived [pp. 240, 243] and Emma’s reaction to her unsuccessful interview with a publishing executive [p. 245]. What do they reveal how each of them approaches life’s ups-and-downs? “Now that she was actually involved in an affair—its paraphernalia of secret looks, hands held under tables, fondles in the stationery cupboard—she was surprised at how familiar it all was, and what a potent emotion lust could be, when combined with guilt and self-loathing” [p. 221]. What does the affair with Mr. Godalming reflect about Emma’s state of mind as she approaches her mid-thirties? What satisfaction does it give her? To what extent is she influenced by the romantic notions and expectations society imposes on unmarried women? When he meets Sylvie Cope, Dexter thinks, “And yet, despite all this, the downturn in professional fortunes, he is fine now, because he has fallen in love with Sylvie, beautiful Sylvie. . . .” [p. 251]. In what ways does the affair open Dexter’s eyes to new possibilities and a different way of life? What flaws in their relationship does he fail to grasp fully and why? What consequences does this have on the course of their marriage? What is the significance of the wedding Dexter and Emma attend [p. 269-296]? What do they learn about themselves and each other that surprises, pleases, or unsettles them? What do their conversations [pp. 286, 290, 293, for example] represent in terms of their personal development as well as the evolution of their friendship? What does the rendezvous in Paris share with Emma and Dexter’s trip to Greece nine years earlier? What impact does Emma’s success as an author and Dexter’s failed marriage have on the “balance of power” between them? Discuss the factors—including age, their individual circumstances, and the length of their friendship—that contribute to their willingness to be more honest and open with each other. Do Emma’s musings about where life has taken her [p. 381] resonate with you? What do Emma and Dexter at forty have in common with the people they were on graduation night? How does Nicholls simultaneously capture the ways people change and the persistence of individual characteristics through the passage of time? 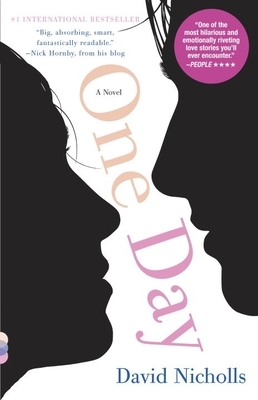 What demands does the unusual structure of One Day make on the reader? Discuss how the yearlong gaps between chapters; the focus on sometimes-mundane happenings rather than “big” events; and the alternation between Dexter’s and Emma’s journeys within each section increase your curiosity and engagement with the novel. Callum is casually mentioned as mutual friend in Chapter 2 [p. 21] and chapter 6 [p. 109] and Ian makes his first appearance simply as Emma’s co-worker in Chapter 3 [p. 37]; both will become significant figures. What other secondary characters become more important than the protagonists—and the reader—anticipate? What do these “surprises” reflect about the way lives unfold? What does One Day share with traditional boy-meets-girl stories you are familiar with from books or movies? What does it suggest about the relationship between love and happiness? How well does the novel capture society and culture over the twenty-year period? What specific details (references to books, television programs, political events, etc.) help bring the different periods to life? In what ways do the characters embody the qualities, good and bad, of their generation? Throughout the novel, Dexter and Emma withhold or suppress their feeling for one another. Is one of them more guilty of this and, if so, why? What role does fate (e.g. Dexter’s unsent letter, missed phone calls, etc. ), along with the characters’ assumptions and misinterpretations, play in the plot? The final section of the novel is introduced with a quote from Tess of the D’Ubervilles and in the acknowledgments [p. 437] Nicholls says, “A debt is owed to Thomas Hardy.” If you are familiar with Tess or Hardy’s other novels, discuss how his works might have influenced Nicholls in writing One Day.